Oklahoma Works collaborates with public and private sector partners to align and connect education and workforce resources, remove workforce barriers and better support Oklahoma employers and jobseekers. These partners use data to inform policy, track progress and measure the success of the initiative, as well as review funding sources and incentives provided by federal, state and local sources in order to ensure the effectiveness of funding used by the state’s education, workforce and economic development system. For more than a hundred years, Oklahoma’s system of career and technology education has been elevating the future of the state’s citizens and industries by providing the training needed to achieve success in the workplace. The Oklahoma Department of Rehabilitation Services expands opportunities for employment, independent life and economic self-sufficiency by helping Oklahomans with disabilities bridge barriers to success in the workplace, at school and at home. The Oklahoma Employment Security Commission works to: match jobs and workers to increase efficiency in labor markets; provide unemployment compensation to support unemployed workers; prepare a skilled workforce by aligning their skills to labor market needs; and gather, analyze and disseminate labor market information. Oklahoma ABLE Tech delivers quality services and assistive technology to Oklahomans with disabilities, increasing opportunities to achieve productivity and independence. The Oklahoma Board of Private and Vocational Schools sets minimum standards for private vocational schools, including: standards for courses of instruction, qualification of instructors, financial stability, advertising practices, and reasonable rules and regulations for the operation of private vocational schools. OCAST provides funding for projects, paving the way for further economic growth and diversification in Oklahoma’s economy. Oklahoma Department of Commerce recruits new business to Oklahoma, fosters an entrepreneurial culture to encourage the start-up of new business, and partners with communities to ensure existing businesses grow and prosper. The Oklahoma Department of Corrections is responsible for the administration of the state prison system. The Oklahoma State Department of Health is responsible for protecting and improving the public’s health status through strategies that focus on preventing disease. The Oklahoma Department of Human Services improves the quality of life of vulnerable Oklahomans by increasing people’s ability to lead safer, healthier, more independent and productive lives. The Oklahoma Department of Mental Health and Substance Abuse Services provides services to Oklahomans affected by mental illness and substance abuse. The Oklahoma Department of Veterans Affairs provides complete service to the state’s veterans, including nursing care, financial assistance in emergencies, and field counseling in the filing of claims for federal and state benefits. The Oklahoma Health Care Authority is responsible for purchasing state and federally-funded health care, analyzing and recommending strategies for optimizing the accessibility and quality of health care, and cultivating relationships to improve the health outcomes of Oklahomans. The Office of Educational Quality and Accountability supports high level student performance by ensuring quality evidence based educator preparation, improving P20 school efficiency and effectiveness, and providing comprehensive statistical information for all stakeholders. The Office of Management and Enterprise Services provides administrative and information technology services to the state’s government agencies. The State Department of Education ensure public education for students in Pre-K through 12th grade. The Oklahoma State Regents for Higher Education coordinates the state’s higher education system, which includes two research universities, 10 regional universities, one public liberal arts university and 12 community colleges. The Oklahoma Educated Workforce Initiative engages business leaders in the development of education policies that will match the state’s PK-12 education system to the needs of tomorrow’s workforce. The State Chamber of Oklahoma is the leading advocate for business in Oklahoma, working on behalf of the Oklahoma business community to affect legislative change and create a pro-growth climate statewide. The State Chamber leverages meaningful partnerships, resources and coalitions to achieve legislative results that strengthen Oklahoma’s economy. KEN Champions are regional business leaders who coordinate local efforts to better align education with workforce needs. 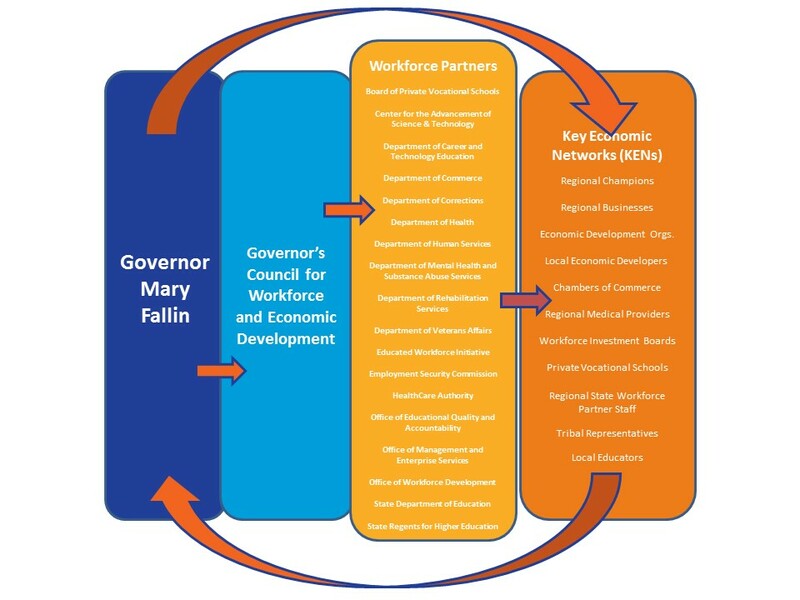 Local Key Economic Networks may include Chambers of Commerce, economic development organizations, education institutions, private vocational schools, regional businesses, workforce development boards and partners, Native American Tribes and other community-based organizations.